Troy Bond was drafted with Pick 88 of the 1992 National Draft from Port Adelaide, but didn't come over from his native South Australia for a whole season. But with his arrival came much excitement and talk of his acceleration over the first 5-10 metres. At this time in footy history the football world was agog with Gavin Wanganeen, the little Bomber back pocket player who was creating a storm with his zip and courage. Bond was a very similar player (indeed his cousin), but started off his career in the forward line. Bond's debut game was against the Crows in Round 1, 1994, and he kicked 3 goals in a 16 possession game that had us all excited. A few weeks later in Round 6 Bond and James Cook kicked 11 goals between them at Optus v. the Swans - all in the Crowd thought that the Blues had uncovered new forward stars who would carry our forward line for the next 10 years. From that point on, Bond was shown a lot more respect, but he still finished with 25 goals from 21 games in a great first year. In his second year at the Blues, Bond was a little bit in and out of the side as the Blues, in supreme form, went from strength to strength. However, he did play every game from Round 16 up until the Preliminary Final win against the Roos, a total of 15 for the year. Unfortunately, with the Blues at full strength for the Grand Final and Scott Camporeale, who had played every game but missed the Preliminary Final due to injury now fit, Bond became the unlucky player to miss out. He did not take this well and walked out on the Club. Bond was traded to the Crows in a 3-way trade with Geelong; in return, the Blues secured Cat Adrian Hickmott who would have his own stellar career on the Blues forward line after 50 games down the highway. The third player was Martin McKinnon, traded from Adelaide to Geelong. But this story is about Bond. Gutted by the decision of the Blues, Bond went back to Adelaide but was fortunate to be able to make up for his disppointment at Carlton by winning a Premiership Medal in 1997. We can only imagine how he would have felt if he had finished up without that premiership! It must be noted that he was far from being a passenger in that team as he contributed 4 valuable goals for the Crows in the Grand Final. Unfortunately injury ruled him out from the 1998 premiership team. Bond would retire after the 1999 season after playing 58 games and booting 51 goals for the Adelaide Crows. 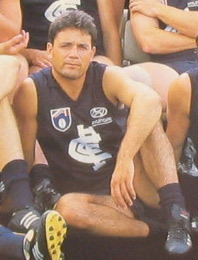 Overall, Bond played 36 games for the Blues over 2 seasons in the #8 guernsey. He also represented South Australia in one state of origin game in 1994. Incidentally his brother Shane played in the 1994 West Coast Eagles premiership team. Contributors to this page: Bombasheldon , molsey , pblue , WillowBlue , BlueWorld , true_blue24 , Jarusa , keogh , steve and admin . Page last modified on Tuesday 04 of June, 2013 20:48:11 AEST by Bombasheldon. 1995 Brownlow - Ang & Kouta attend with Ang's sister. 1983 Rd 10 - Mark Buckley.